It’s Copenhagen in the depths of winter, two young women are found brutally murdered. The killer has left a small doll made from chestnuts as his calling card. Tasked with handling the case, detective Naia Thulin is paired up with Mark Hess, a burnt-out case - sent home in disgrace following a posting with Europol. Working in an uneasy partnership, they uncover links to the disappearance of the daughter of a prominent politician, and a killer with a deadly point to make. 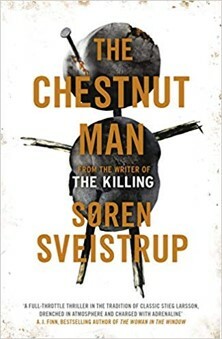 Sveistrup is a writer with form. He created the worldwide TV hit The Killing, his debut novel is cut from the same cloth of excellence, the same fabric. He has a master's understanding of the importance of pace; each short chapter is a miniature scene designed without a word going to waste to hook you into the next. This is a boon for readers, and a threat to reviewers trying to achieve a reasonable amount of sleep. Characterization is one of his strong suits too. Thulin and Hess are fully rounded creations weighed down by the dramas of their working, and domestic lives. The narrative is played out in a Denmark that is awkwardly negotiating its way between the constraints of social democracy, and that of free market capitalism. This book is a bestseller in waiting, and with top-marks for Sveistrup of this debut noel; as this appears the start of a literary career, one that is set to be every bit as lauded as his screenwriting.